The BladeSystem c7000 enclosure provides all the power, cooling, and I/O infrastructure needed to support modular server, interconnect, and storage components today and throughout the next several years. The enclosure is 10U high and holds up to 16 server and/or storage blades plus optional redundant network and storage interconnect modules. It includes a shared, 5 terabit per second high-speed Non stop mid plane for wire-once connectivity of server blades to network and shared storage. 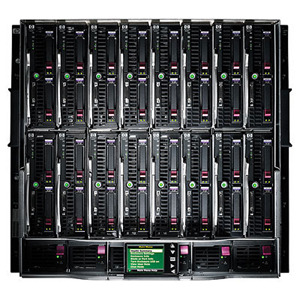 Power is delivered through a pooled-power backplane that ensures the full capacity of the power supplies is available to all server blades for maximum flexibility and redundancy. Power input flexibility is provided with choices of either single-phase, 3-Phase AC input and -48V DC Input.